After days of 95+ degree weather, there’s been a cold spell punctuated by clouds and rain. The temperature ranges from the 50s to 60s, and it’s nice to throw on a sweater before going out. I have not had too much wine as of late because of the heat–I focused on Anchor Steam beer, as these were sophisticated, delicious, and refreshing. I couldn’t bring myself to open a bottle of wine–even nice, thirst-quenching varieties like vinho verde and sauvignon blanc. Reds, of course, were out of the question. Thus I was pleased when the thermostat was turned down a few degrees, especially for my longer than usual Memorial Day weekend (I took this Friday off and get Monday off as well!). On Friday I headed to Mission Wines for a spell to pick up a good cold weather red. I was surprised: there were a lot more people there on Friday at 4:30 pm than I would have thought. Debbie, Dave, and Chris were there tending bar. There was a chef in whites there, sampling a few wines, along with some neighborhood regulars like Kirk, who kindly gave me a pour of a fantastic Paso Robles syrah from Jada Vineyard. It was named “Jersey Girl”. The 2005 “Jersey Girl”, named for Robyn’s proud roots, is Syrah harvested from the tops of the hills. The tops came in about 10 days earlier than the bottoms with great fruit and acid balance. The fruit was de-stemmed and whole berries were gravity feed to 1.5 ton open top fermenters. Following a five day cold soak the wines underwent a slow 14 day fermentation. Cap management consisted primarily of punch downs with an occasional delistage. The wines were basket pressed to 80% French and 20% Hungarian Oak barrels of which 50% were new. After 16 months in barrel the wines were bottled unfined and unfiltered. Loads and loads of flavor. A lot of fruit: blueberry and boysenberry. Very full, round, rich, with less chocolate and earth than Australian shiraz. An excellent wine that I can find myself drinking forever. Unfortunately, it was also priced accordingly: about $40+. I was on a budget ($15.00 or less) so I looked through the Mission Wines bargain section. I was thinking Cotes du Rhone for something more rustic, comfortable, and earthy. My eyes spied the 2005 La Grange de Piaugier from Domaine de Piaugier. I picked up the bottle and asked Debbie whether it would meet my criteria of “winter red”. She replied that it would be good for cooler, but not cold, weather–exactly what I had in mind. She said it would have nice body and depth, not as powerful as, say, a monastrell, but nicely balanced. At $9.99, it was definitely at the right price point, too. My brother and I opened up the bottle as soon as I came home. It was a light-to-medium-bodied wine, some good tannin and acid. It had a pronounced herbaceous quality: thyme? rosemary? Some earthiness. There was some fruit and, oddly enough, some red vine on the finish. Very satisfying, but still, something was missing. Then it came upon me: it was missing a nice piece of meat. We drove to the Whole Foods, got some nice New York strip steaks. We decided upon green beans and potatoes fried with garlic, thyme, and parsley. The steaks we seasoned only with cracked peppercorn, and cooked on our new cast-iron skillet. The wine paired beautifully with all the food: smooth, subtle, the herbaceous quality of the wine complementing the thyme in the potatoes and the pepper of the steak. 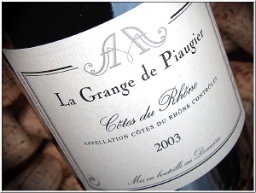 La Grange de Piaugier is comprised primarily of grenache, with smaller portions of syrah, mourvèdre, cinsault and carignan. The producer also makes a wine called “Sablet” which I would love to try next!